Like all other North American swallows, the Tree Swallow is a highly skilled flier that spends many of the daylight hours in the air. The beautiful iridescent color and conspicuous flying antics make it one of the most enjoyable songbirds to observe. Outside the breeding season and in migration, Tree Swallows flock in the thousands and are quite a spectacle as they form “tornado spouts” when landing to roost at night. The Tree Swallow is a small songbird with a slender body and long, pointed wings. It has a flattish head and a short neck, legs and bill. The tail is short and notched. Adults: Both sexes appear alike after first year: iridescent blue-green above, white below. First year female: Brownish above with some iridescent greenish feathers above, some bluish in tail. Juveniles: Sooty gray above, under parts dull white with brown band across chest. 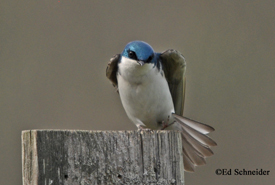 Tree Swallows prefer open areas, such as fields close to water, marshes, lakes and shorelines. 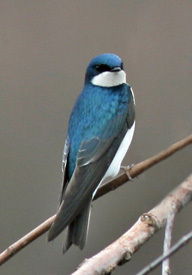 Tree Swallow often forages in the air above water where there are high densities of flying insects. Unlike other swallows, the Tree Swallow can digest wax from certain berries, including bayberry and wax myrtle, which are important food sources in the winter. Tree swallows traditionally nest inside an abandoned woodpecker hole, or in cavities in dead snags. The nest is an open cup of grass or pine needles, often lined with feathers from waterfowl. The feathers add warmth to the nest and help to control mites and other parasites. Pairs will nest as close as 100 feet to each other if the food supply is adequate. Incubation period: Only female incubates for 14 to 15 days. Male does not feed incubating female, but perches near nest site. Nestlings are fed by both parents and fledge the nest after 18 to 22 days. Parents continue feeding fledglings for only about 3 days. Songs are a series of whistles and twitters, usually made in flight. A low gurgle when communicating with mate. Alarm call a loud shriek: peee! •	The first nest record for the Tree Swallow in Tennessee was in 1918 at Reelfoot Lake, but there were no additional nest records until 1968 when nests were found in Anderson and Maury Counties. Tree Swallows are now found nesting in scattered locations across the state. The reason for their rapid expansion into Tennessee, and elsewhere in the range, is likely related to occupancy along establish Bluebird Trails. •	Tree Swallows are unlike other songbirds in two ways, 1) the female requires 2 years to attain adult plumage, even though she is fully capable of successfully breeding in her first year, and 2) most birds do not return to breed in the area where they hatched. •	During the non-breeding season, Tree Swallows congregate in enormous flocks, often in the hundreds of thousands, near roost sites. •	Tree Swallows are famous for using feathers from other birds to line their nest. These feathers not only keep the nestlings warm, but also appear to reduce the numbers of ectoparasites affecting the young. •	The oldest known Tree Swallow in the wild was 12 years 1 month old. Preferred box design for Tree Swallows is slightly smaller than the NABS Eastern Bluebird box with a 1 ¼ inch entrance hole. This box design may also be used by Carolina Chickadees, White-breasted Nuthatches, House Wrens, and Prothonotary Warblers. Make corner opening on the floor bottom of the box to allow drainage and facilitate ventilation. Never include an under-the-hole perch. The roof should provide sufficient overhang beyond the box entrance or vent holes to protect the birds from the elements. The roof should have a minimum of ½ inch overhang at the back. The nest box must have watertight construction at all seams. Cross ventilation is strongly recommended. Include one hinged, side panel that opens for easy monitoring and cleaning. Ideally your box should be placed out in the open; in the middle of a rural field that is located near a wetland area or lake. The box should be at least 100 ft from a forest edge. It is best to place the boxes away from buildings and roads. If installing more than one box, keep boxes 100 feet from each other. In areas where Bluebirds are competing for cavities, placing two boxes within 25 feet of each other may allow both species to nest together peacefully. The nest box should be mounted on a ½ to ¾ inch electrical conduit post placed over a 3 to 4 ft. piece of rebar. Both materials are available at hardware stores. Pound the rebar into the ground and slide the post over it, making sure that it is solid and steady. Mounting the box on a tree or fence post is not recommended. Mount the box so that the entrance hole is about 5 ft. from the ground and facing, if possible, to the east, away from direct summer afternoon sun and from north winds that may drive rain into the box. Squirrels or woodpeckers sometimes damage the entrance hole, making the hole larger and thus allowing undesirable species to enter the box. This can be resolved by placing a copper or other metal hole-guard (available at hardware or wild bird retailers) over the damaged hole. A block of 1.5” hardwood with an entrance hole made and placed over the original hole will also work. To prevent doing more harm than good, do not install a box if you do not plan to monitor it. Checking the box once a week during the nesting season will help you keep out undesirable species and pests, check for leaks and damage on the box, and provide you with a wonderful education. Keep in mind that even the perfectly built and placed box may not attract a breeding pair the first year. If after two years of not having native birds nesting in your box, you may want to move it to another site. Check the box only on a warm, dry day. On your day to check the box, try to observe activity of the adults and approach the box while they are away. If they are present, don’t worry that they will desert the nest. They may fly to a perch to watch you, and you may receive a few scoldings from them, but they will return when you leave the area. Check for ants or other parasites. Make it a habit to check for wasp nests so they can be removed while they are small. Rubbing surface with a bar of soap helps deter wasps from building. Remove and destroy House Sparrow eggs and nest. To prevent premature fledging, do not open the box after 12 days from the time the nestlings hatch. Remove and dispose of the nest in the trash soon after the nestlings have fledged.